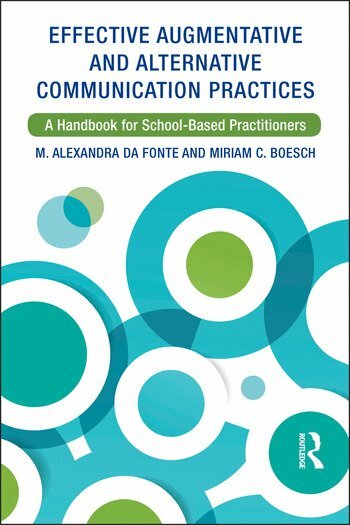 Effective Augmentative and Alternative Communication Practices provides a user-friendly handbook for any school-based practitioner, whether you are a special education teacher, an augmentative and alternative communication (AAC) consultant, assistive technology consultant, speech language pathologist, or occupational therapist. This highly practical book translates the AAC research into practice and explains the importance of the use of AAC strategies across settings. The handbook also provides school-based practitioners with resources to be used during the assessment, planning, and instructional process. M. Alexandra Da Fonte is Assistant Professor of the Practice in the Department of Special Education at Vanderbilt University, USA. Miriam C. Boesch is Associate Professor in Special Education at the University of North Texas, USA.